Increasing user engagement has become a mantra for SaaS product teams, and with good reason. That engagement is an essential quality of a high-growth product that retains customers and minimizes churn. Recently, my colleague Amie highlighted how emails like welcome messages, activity notifications, and even password resets are an important tool for activating and retaining SaaS users. But to be successful, product teams need to approach those emails with more care than the simple faith that “if you send it, they will come.” In fact, app teams can learn a lot about engagement from another group of people who’ve been using email to drive customer engagement for a long time: email marketers. Here are three lessons from email marketing that can help product teams develop more effective email notifications and other app-generated messages. In email marketing, a basic metric of a message’s relevance to the target is its deliverability—that is to say, whether it even makes it to the user’s inbox. That sometimes surprises folks who aren’t steeped in the world of email, but here’s why it’s an issue. When email doesn’t reach the inbox, it’s often for reasons more complex than a straightforward bounced email address. Mailbox providers like Gmail and Outlook use complex algorithms to assess whether you belong in user inboxes. These algorithms look at a spectrum of factors to determine whether your message should be tagged as a relevant message, a promotion, or junk. We’ll drill down into some of these in the future, but there are already great deliverability resources for learning about everything from boosting sender reputation to SPF implementation. It’s the same as in software design: If an app isn’t user-friendly or lacks sufficient utility, the user will delete it without a backward glance, exactly the same way they (or their email service provider) are hitting the spam button on irrelevant or badly-timed emails. How do you promote retention as an engagement factor, whether in email marketing or software? By designing your campaign – or your product – to respond to the recipient or user’s behaviors. In the case of email marketing, one example is to nurture people through the sales funnel by sending emails calibrated to their actions along that path. 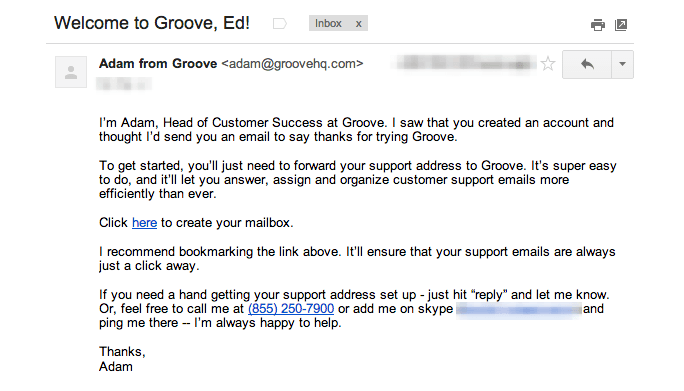 Here’s an example from Groove, a help desk software provider. A user opening a trial account was the trigger for an email that welcomed them aboard with a personalized message from the customer support lead. Did it work? Their conversion of trial users to paid users increased by 10%. Exploiting behavioral triggers shouldn’t end once your users have been converted. Again, sustaining engagement over the long haul depends on conveying the right prompts at the right times. That’s a key factor in determining the types of emails your product sends (and when). In software product design, including unlocks or upgrades that reward trial, regular usage, or other actions is a common way of maintaining user engagement throughout a product’s lifecycle. 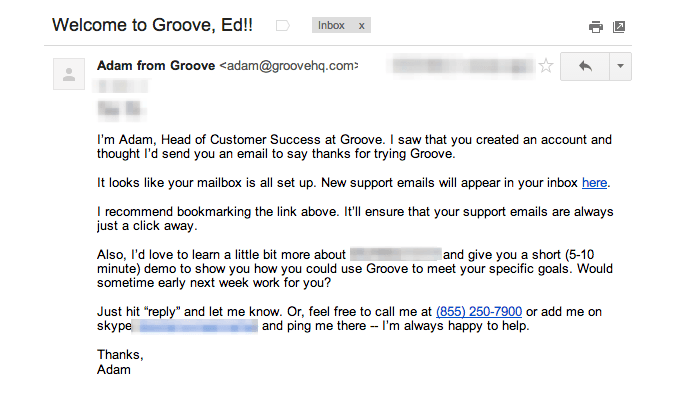 Apply that same same growth hacking method to your product’s emails. Perfecting the user experience—again, whether it’s in product design or email—means constant refinement, and that only comes from testing prototypes. That’s why the onboarding and notification mails your product sends should be tested as rigorously as you test your app’s UX (and your marketing team tests their promotional messages). The version above prompted users to open a free mailbox. The one below nudged them to try a product demo. In all, according to Optimizely, Groove tested 22 different emails based on user triggers to get to the final six they sent during user trial periods. Testing like this is critical to optimizing an individual message or an entire campaign. The lesson for SaaS teams? If you don’t test and refine your app’s notifications and engagement messages to make sure they actually connect and meet the real needs of users, you’re leaving a lot of potential engagement (and revenue!) on the table. Ineffective emails—whether marketing or product messages—squander one of your most precious resources: your users’ time and attention. There are even more lessons to be had from email marketing that can help SaaS product teams increase user engagement via app notifications. In my next post, I’ll look at some of the specific qualities of good marketing emails that also can help product teams develop more effective alerts and notifications for their product.